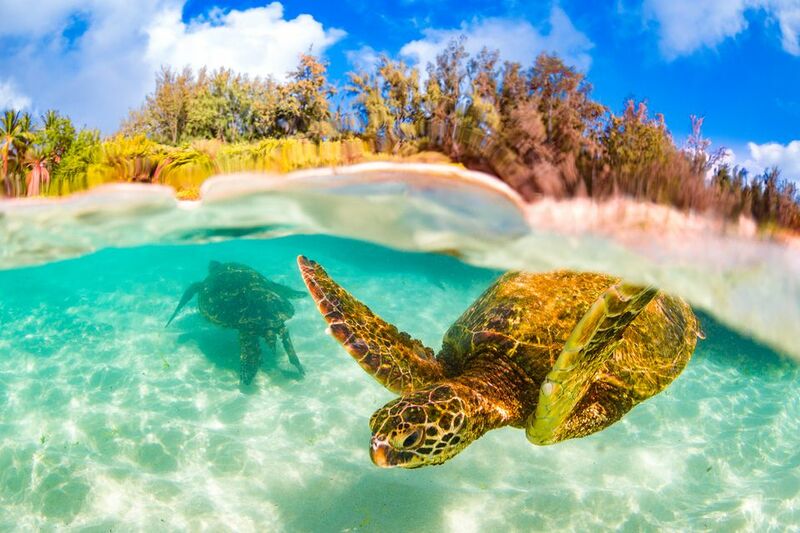 There’s nothing like diving into the crystal clear waters of Hawaii in search of colorful tropical fish and exotic ocean wildlife. The islands are home to honu (green sea turtles), he’e (octopus), nai’a (dolphins) and even majestic humpback whales during the winter months. If you’re lucky, you might even spot the Hawaii state fish, humuhumunukunukuapua'a (reef triggerfish). Especially during the summer months, Oahu’s waters are warm and inviting for snorkelers — that means you won't need a wetsuit, and don’t forget the reef-safe sunscreen! Whether you’re enjoying the Pacific Ocean from the shore or jumping off a catamaran, the snorkeling on Oahu is some of the best in the world. This curved bay and state park is known for its year-round snorkeling and convenient accessibility. Since 1967, Hanauma Bay has been a protected marine life conservation area and a favorite spot for visitors to enjoy snorkeling off the shore. You’ll mostly see tropical fish and turtles feeding off the reef here, though some people are lucky enough to spot an eel. The only entrance to Hanauma Bay is off Kalanianaole Highway on the east side, and parking is available for $1 per car or you can take a shuttle — just don’t try to go on a Tuesday when they close the whole park (to give the reef a break). You’ll also have to pay an admission fee of $7.50 that goes towards conservation and watch a short video on reef safety before heading down to the beach. Since this is a very popular tourist spot, it’s best to arrive right when they open at 6 a.m. to avoid the crowds. There are lockers and snorkel equipment for rent at the beach. Hanauma Bay is the perfect spot for first-time snorkelers or those who may need a refresher on reef etiquette and snorkel safety. Don’t let the name fool you — Shark’s Cove isn’t known to contain sharks (except for perhaps a couple of tiny white-tipped reef sharks). Located in Pupukea between Waimea Bay and the Banzai Pipeline, this spot has been a local north shore secret for years. Plan on seeing plenty of fish, turtles, eels, and sea urchins here, but those with sensitive feet may need water shoes to get past the rocky area to access the shore (once you’re in the water do not stand on the rocks or coral--this is the ocean life's home). If you forget your gear or don’t have any, cross the street to rent snorkels, masks and fins — there are also a few food trucks and a grocery store to grab some lunch or shave ice after a snorkel sesh. The main area on the right is for more intermediate swimmers, but there is a calm tide pool area that is great for kids on the left side. It gets rough during the winter months here as well, and there is no lifeguard, so it’s best just to enjoy the view from outside the water when the waves are big. On the eastern side of the Turtle Bay Resort on Oahu’s north shore lies Kuilima Cove, one of the best spots for beginner to intermediate snorkeling on the island. It’s a beautiful beach for lounging, which makes it a perfect options if not everyone in your group wants to get in the water. Since it’s right next to the hotel, the facilities are much better here than at other beaches on the list — bathrooms, showers, even a restaurant. You can park for free in the public lot inside Turtle Bay, just head through the entrance off Kamehameha Highway and follow the signs to beach parking. Also known as “Electric Beach” because of the electrical plant that shoots warm water into the sea that the ocean life loves, Kahe Point is best left for advanced swimmers. The current is strong, so getting in and out can be a workout even if the surf looks small. Plus, there’s no lifeguard. Turtles, fish, small sharks and dolphins enjoying hanging out by the warm water coming out of the pipe, which you check out to on the right side if you’re a strong swimmer. Kahe is also a popular spot for scuba diving and spearfishing, so don’t forget to share the space! There is parking and public restrooms available, but make sure not to leave any valuables in your car. Nicknamed “Turtle Canyon” by the Waikiki tour companies, this spot is a reef off the coast of Waikiki Beach only accessible by boat. The reef here is a favorite spot for the area’s turtles to come clean, feed and relax. Turtles are the highlight here; you won’t see much other wildlife (besides fish cleaning the sea turtles) from snorkeling as the reef is sandy and shallow. Hop on one of the catamarans on the beach to check out the honu from the boat or jump in to snorkel. Check out the Holokai or Makani catamarans for a great deal on a Turtle Canyon snorkeling tour. A pristine section of Kailua Beach on Oahu’s east side, Lanikai is widely known as one of the most beautiful beaches in the country. It’s best to snorkel here when the water is calm, as the fine sand can make the visibility a bit cloudy. Parking can be a little tricky, so you can either find street parking in the residential area (look out for signs to avoid parking tickets) or park in the Kailua Beach lot and walk. Shoot for a weekday because weekends get super busy and parking can be impossible. The entire Kailua Bay is a protected feeding ground for the endangered honu, so expect to see a turtle or two munching seaweed off the rocks — don’t forget to keep your distance! Kailua Beach Adventures offers options to rent snorkel equipment to explore yourself or book a tour that combines snorkeling with kayaking for an extra epic day. The Ko’olina area on the west side of the island encompasses several resorts with public beach access. The four protected lagoons that front the beach are perfect for a calm snorkel sesh for children and beginners. There is public parking available for all four lagoons from sunrise to sunset that is first come-first served, or you can pay for valet parking at one of the resorts (like the Disney Aulani Resort). Follow the H1-West until it turns into Hi-93 and take the Ko’olina exit, it will bring you directly into the resort area. Bring your own snorkel gear or rent from one of the hotel kiosks on the beach. Since it is a protected lagoon, you’re pretty much limited to tropical fish here, but sometimes you can spot a turtle. Just like most beaches on the north shore, Waimea Bay is best explored during the summer months when ocean conditions are less rough. This beach has some of the best waves during the winter season (we’re talking 40+ foot waves) and houses some pretty famous big-surfing competitions. In the summer, however, the beach completely transforms into calm waters perfect for swimming. Dolphins hang out here early in the mornings sometimes, as well as tropical fish, turtles and even monk seals. Waimea has full facilities with a lifeguard, bathrooms, showers, parking and changing areas (if the parking is full, try across the street at Waimea Valley). While you can absolutely experience the Waianae Coast by snorkeling off the beach in Makaha (check the surf report first, it can get choppy), the best way to see wildlife in this area is by boat. Dolphins can’t get enough of this side of the island, and they love the protected areas close to shore. You can also spot tons of fish, whales during season, turtles, eels, and rays in these waters. Go with a company that participates in the Dolphin Smart Program like Ocean Joy Cruises. They really make an effort to respect the wildlife and keep a safe distance from the dolphins, while still giving you the opportunity to snorkel at several different spots along the coast. One of the most unique spots on the island, Kaneohe Sandbar is best accessed by boat or kayak (you can even SUP there on a calm day). When the tide is low, the sandy area turns into a shallow spot where locals come to lounge, float around or play games. Book a tour with Holokai Kayaks if you don’t have access to a boat, proceeds go towards conservation, and you can choose to go with a guide or on your own. Rays and turtles frequent this area, as well as the usual suspects like tropical fish.